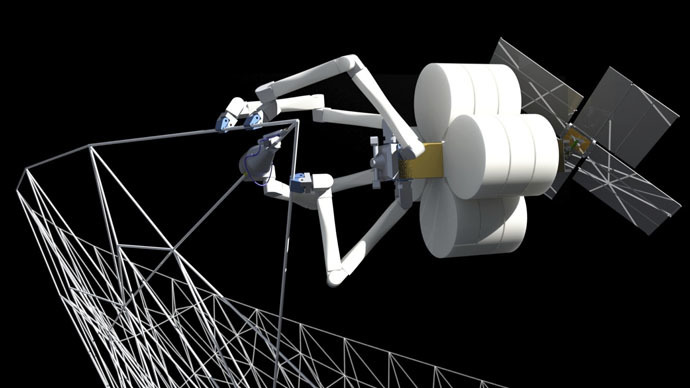 A NASA-funded program called SpiderFab is developing a revolutionary system which aims to use spider-like droids to build large objects in orbit or beyond. The technology may help humanity to build a new home in space. The futuristic plan has been drawn up by scientists from Tethers Unlimited (TUI), a US private aerospace company, which makes research and development of new products and technologies for space, sea and air. The project is funded by NASA's Small Business Innovation Research (SBIR) program. “SpiderFab provides order-of-magnitude packing- and mass- efficiency improvements over current deployable structures and enables construction of kilometer-scale apertures within current launch vehicle capabilities, providing higher-resolution data at lower life-cycle cost,” Tethers said. The program, which now is probably viewed as something akin to Star Wars, aims to decrease costs and increase efficiencies. The raw materials will be first launched to orbit and there arachnid-like droids would assemble and integrate them into larger systems, Rob Hoyt, CEO and chief scientist of Tethers Unlimited, said. "Our really long-term objective for all of this work is to eventually enable the use of in-situ resources to construct the infrastructure in space needed to support humanity's expansion throughout the solar system," Hoyt said March 4 during a presentation with NASA's Future In-Space Operations (FISO) working group, Space.com reported. The objects to be built in space will be simpler than the ones launched from the ground, as they don’t have to survive the rigors of launch. This will conclude in reductions in objects’ complexity and thus lower costs, Hoyt said. "The primary one will be that we can deploy apertures and baselines that are much larger than we can currently fit into launch shrouds," he said. "The payoff of that will be higher power, higher resolution, higher sensitivity and higher bandwidth for a wide range of NASA, DoD [Department of Defense] and commercial space missions." Hoyt hopes that SpiderFab could be implemented in the next decade or so. “This "Trusselator" device will enable construction of large support structures for systems such as multi-hundred-kilowatt solar arrays, large solar sails, and football-field sized antennas,”Tethers Unlimitedsaid.